How one former heroin addict is enacting positive change. 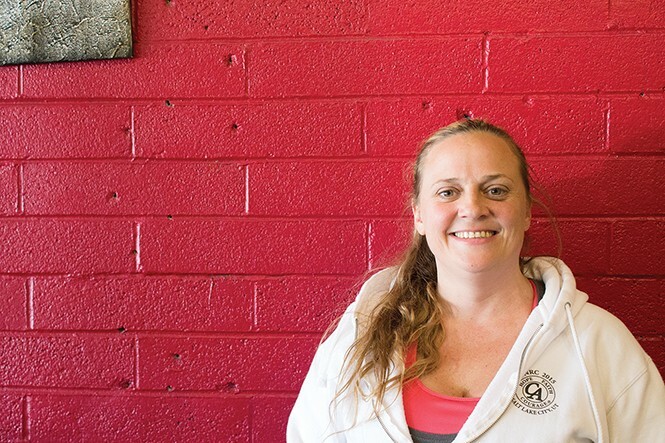 Before Mindy Vincent became the founder and executive director of the Utah Harm Reduction Coalition (UHRC), she was in the throes of heroin addiction. Her little brother used the substance and she lost her older sister to an opioid overdose. Fearing she'd have to bury another sibling, enough was enough. Vincent started the coalition shortly thereafter. Designed to offer addicts much more than just clean syringes, it also provides resources like access to drug treatment funding, low-to-no-cost HIV and Hepatitis C testing and housing resources. How does the needle-exchange program work? [Participants] enroll into services and we do a full risk assessment for HIV and HCV. Then people have to turn in at least one, but it's a one-for-one-plus exchange. If people are there for their first time, they can get up to 30. We just give them all that; they just come in and exchange as often as they need to. Has Operation Rio Grande affected the exchange program? It really has. We went from serving about 200-300 people every Monday and Thursday [and] doing about 2,000 encounters a month ... last month, I billed for 547 encounters. The month of September, maybe if I am lucky, I'll bill 300 encounters, when we need to bill at least 1,000 to stay alive. As a woman in recovery, how taxing is running UHRC? Each one of these people that I have lost—like, I really loved those people. I love people on a very human level, I just can't help it. It hurts me sometimes; it leaves me very vulnerable to getting hurt. But at the same time, the successes I see make it all worth it. But the thing that's really the most taxing is being attacked by community members or like law enforcement. That's really one of the hardest things that starts to get to me. How is harm reduction a better way to handle addiction than abstinence? One thing people have to understand is that abstinence is on the spectrum of harm reduction. So you know it's not a battle from harm reduction against abstinence. They really can work together, and the truth is, not everyone is ready to get sober and not everyone can obtain abstinence. I know that we like to say, 'If you wanted it bad enough, you would do it.' But that's just not true. Some people have too much trauma; they don't have the right coping skills; they don't have the right temperament; they don't have the ability to manage really difficult things; and people like that have a really hard time getting sober. So we have to reduce people's harm. There are people that are still using that just aren't ready to get sober yet, so do they deserve to be diseased? Do they deserve to lose their limbs, or to be in the hospital and cost taxpayers money because they're not ready to get sober yet? That's ridiculous to me. Is Utah behind the times when it comes to harm reduction? Absolutely. Utah's behind the times on lots of things. What we're hearing from a lot of people is, 'Oh, well, we don't know what syringe exchange will do. We don't know the outcome—there's not enough evidence to support it.' Syringe exchange has been around almost 40 years—that's four decades of good, solid peer-reviewed scholarly research on syringe-exchange programs. So we do know the outcome, but a lot of people in Utah just need to see it for themselves. They need to see their worst fears are not coming true.